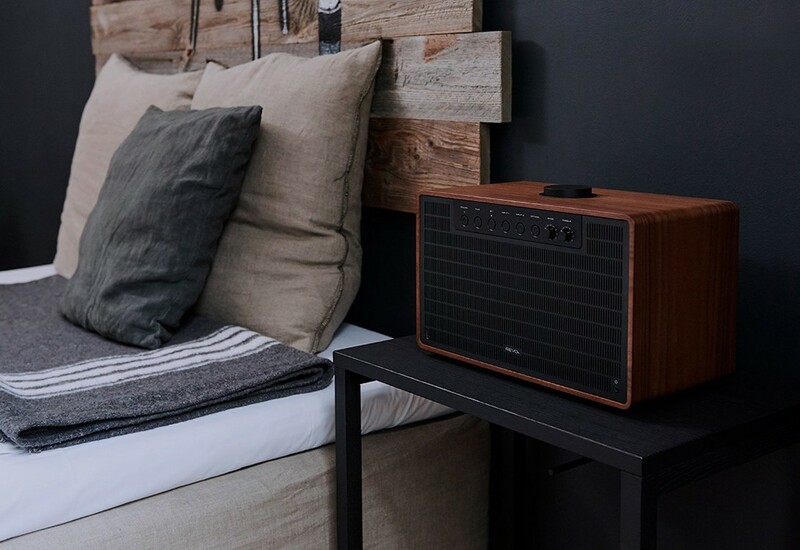 SuperTone personifies Revo's aim to create the ultimate Bluetooth wireless speaker for grown-ups, available in a choice of black or silver anodised aluminium front. 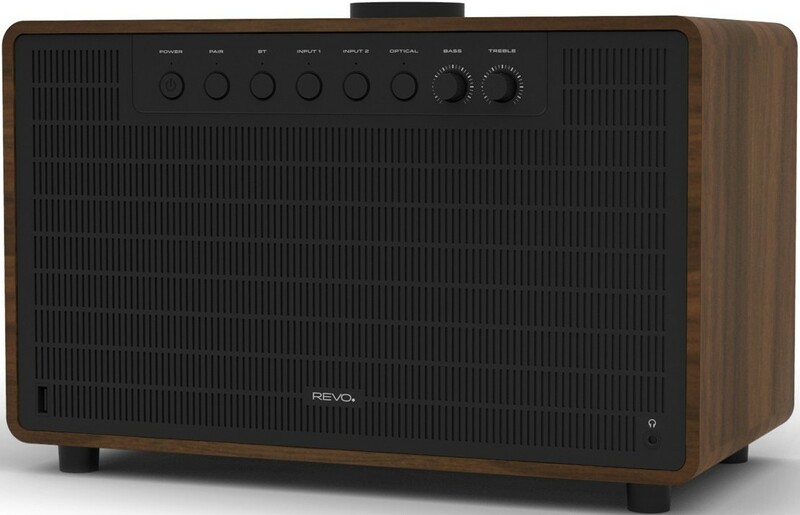 Revo SuperTone Bluetooth is a complete Music System powered by an 80 watt Class-D amplifier, with twin BMR (3.5”) flat-panel speakers and a ported subwoofer (6”). Most Bluetooth speakers are semi-disposable with their plastic construction, however, the SuperTone aesthetic timeless mix of high-quality materials, and renowned acoustic engineering. 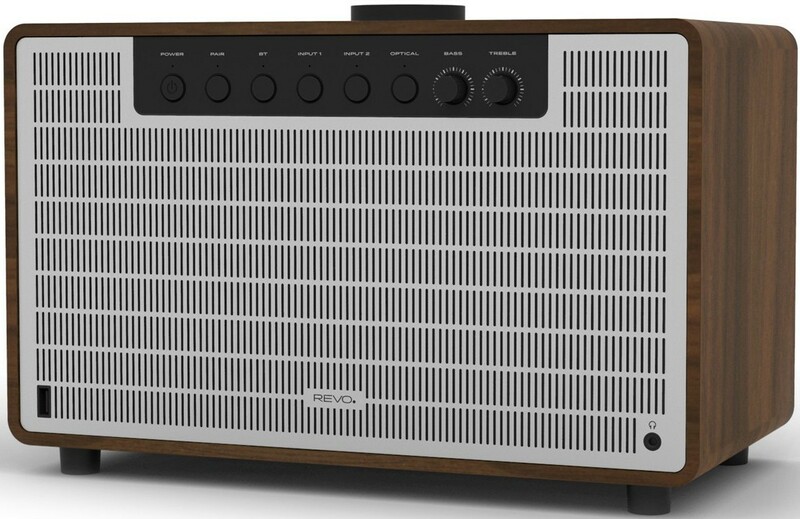 The visual aesthetic inspired by mid-century radio designs hides the cutting-edge electronics within the hand-crafted American walnut casework. Furthermore, by using high-quality materials, such as aluminium (anodized T6), pressed steel and CNC parts Revo adds a reassuring level of detail. The SuperTone system has been engineered to fill large and small spaces with audiophile sound, it creates rich digital audio, with a tightly controlled bass, and an extended listening sweet-spot. The SuperTone will perform irrespective of musical genre, from jazz and rock, to R&B, pure acoustic and or the spoken word, all presented with a richness that leaves a lasting impression. Along with wireless AptX Bluetooth, the SuperTone is equipped with a large selection of wired connectors including a 3.5mm headphone jack, an AUX-IN, digital optical in and stereo RCA in, which allows connection to a wide variety of devices, such as CD players or Sonos equipment. SuperTone comes complete with a USB connector to allows you to charge your smartphone or tablet whilst listening to the SuperTone. SuperTone’s audio characteristics are the result of a considered blend of the finest electronic, acoustic and software design. The SuperTone is built with high-quality audio components, modern digital technology, based on cutting-edge sound modelling techniques they have designed a bass port system, that together deliver category defining performance. The speakers use BMR (Balanced Mode Radiator) drivers, flat transducers combining the performance attributes of a flat speaker with a tradition driver design of a conventional loudspeaker, which results in a high performing speaker capable of wide dispersion and an expanded sweet spot. 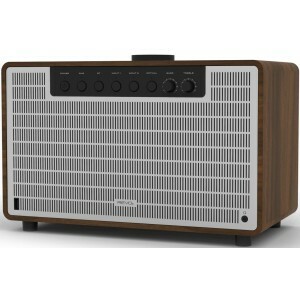 The SuperTone is based on contemporary modelling research to create an award-winning sound profile. In addition to the custom design hardware, the SuperTone’s has its own design equalisation configuration that allows the output sound to be warm with great detail and clarity, with a deep bass without undue colouration and distortion and benefiting from an expansive sound field. 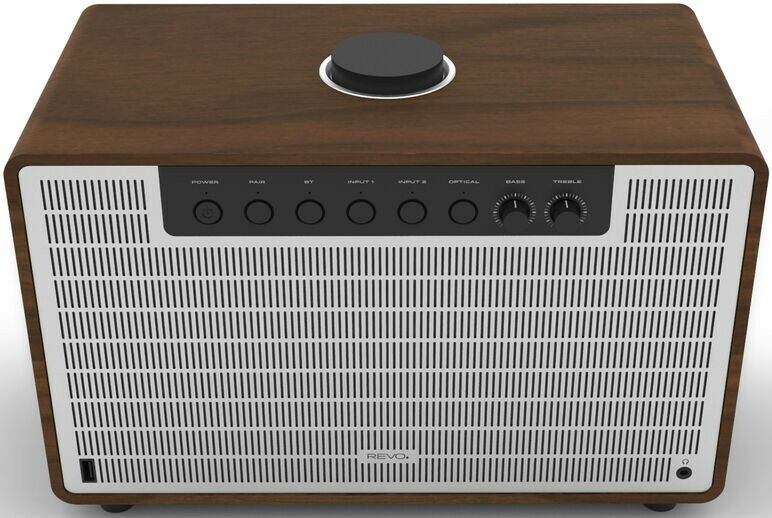 Visually, the SuperTone is a balance of contemporary technology and mid 20th Century charm creating a great sounding and beautiful music system. Revo is always innovating, whilst maintaining a link to history, being inspired and learning from the great 20th century designers. Revo believes that form should follow function and that detail matters. By ensuring they couple great design with quality materials Revo manage to elevate the listening experience to new levels. The cabinet is created from hand-crafted American walnut, selected for its superb acoustic properties, wood has a resonant quality that is unmatched by composite or plastic materials. The use of high quality anodized T6 aluminium for the front fascia and speaker grille, pressing steel for the back plate, and CNC machined aluminium bass, treble and volume control further inject a reassuring tactility and sense of honesty that cannot be achieved with lesser materials. The SuperTone is versatile allowing you to stream to the SuperTone from a wide variety of Bluetooth enabled devices such as tablets, smartphones, and laptops. The addition of aptX technology means that where supported by the transmitting device, streaming music will be at CD-like quality, rather than the MP3 quality of standard Bluetooth streams.